Fragile tropical fish, born to dwell in the majestic seas and forage among brilliantly colored coral reefs, suffer miserably when forced to spend their lives enclosed in glass aquariums. Robbed of their natural habitat, denied the space to roam, they must swim and reswim the same empty cubic inches. The popularity of keeping tropical fish has created a virtually unregulated industry based on catching and breeding as many fish as possible, with little regard for the fish themselves. In the Philippines, the source of most saltwater fish sold in the U.S., many fish divers collect their prey by squirting cyanide or other poisons into the coral reefs where fish live. Meant to stun them so that they will drift out of the reef for easy collection, the cyanide kills as many as half of the fish on the spot. Many others die from cyanide residue after being purchased. The poison also kills the live coral where the fish live, which can take thousands of years to grow back. Most of the freshwater fish sold in the U.S. are easier to breed than their saltwater cousins and are bred on "fish farms." These breeding centers, seeking new market niches, create fish breeds that would never occur in nature. Treating fish as ornaments instead of as live animals, some fish breeders "paint" fish by injecting fluorescent dye into their bodies to make them more attractive to buyers. Fish are wonderful creatures with individual personalities and attributes that most people know little about. They communicate with each other, form bonds, and grieve when their companions die. Fish communicate with one another through a range of low-frequency sounds from buzzes and clicks to yelps and sobs. The sounds, audible to humans only with special instruments, communicate emotional states such as courtship, alarm, or submission. Sadly, the pumps and filters necessary in many home aquariums can interfere with this communication. "At the least, we're disrupting their communication; at the worst, we're driving them bonkers," says ichthyologist Phillip Lobel. Most fish enjoy companionship and develop special relationships with each other. One South African publication documented the relationship between Blackie, a goldfish with a deformity that made it nearly impossible for him to swim, and Big Red, the larger fish who shared his tank. Big Red daily put Blackie on his back to swim him around, and when they were fed, Big Red swam Blackie to the surface, where they ate together. Fish enjoy tactile stimulation in their relationships and often gently rub against each other. Divers tell of gaining the friendship of fish by lightly scratching their foreheads they've found that the fish then recognize and regularly approach them. Don't support the pet fish trade by purchasing fish. If you must have fish, adopt - never shop. If you already have fish, biologists say there is no safe way to return them to their natural environment because of the difficulty in locating such a habitat (often in a far-off country) and the possibility of introducing disease to the other fish there. However, you can make their lives easier by duplicating their natural environment as closely as possible. While no confined fish can live a natural life, the following tips will help make them as happy as possible. The more space that fish have, the happier and healthier they will be. Allow a minimum of 12 square inches of water surface per inch of fish. Treat tap water properly before putting it in the aquarium. Even trace amounts of chlorine can cause breathing difficulties, nervous spasms, or even death. The type of chemicals you should use depends on your area's water; consult with a local tropical fish supply store to determine the proper treatment. Before putting the fish into the aquarium, let the filter and pump run for two weeks to allow bacterial cycling and other environmental adjustments. Different types of fish require different pH levels. Check the pH level daily for the first month and weekly thereafter. A filter is necessary to remove waste particles and noxious chemicals from the water. An air pump will provide oxygen. Fish need a constant temperature, usually 68 to 74 degrees. A 74-degree temperature is right for most fish, but you should check with a fish supply store for information specific to your fish. An automatic aquarium heater will monitor the water temperature and turn the heater on or off as needed. Attaching a small thermometer to the tank will tell you if the heater is functioning properly. Clean the tank regularly, about two to three times a week. The natural waste of fish emits ammonia, which can accumulate to toxic levels. Also be sure to clean the glass well with a pad or a brush so that algae don't grow there. Never empty the tank all at once; fish are most comfortable with water they are used to, even if it is dirty. When cleaning the tank, change only 10 to 25 percent of the water at a time. Plants provide oxygen, shelter, and hiding places, and fish enjoy snacking on them as well. Provide live plants, not plastic ones. Create places for your fish to hide and explore. Ceramic objects, natural rock, and plants all work well. Make sure that all objects are thoroughly cleaned and disinfected before putting them in the tank. Do not use metal objects, as they will rust. Be aware of the environment outside the aquarium. Suddenly switching on a bright light in a dark room can startle fish, and vibrations from a television or a stereo can alarm and stress them. One study found that fish repeatedly exposed to loud music can develop fatal liver injury. Keep all harmful chemicals away from the aquarium's vicinity. 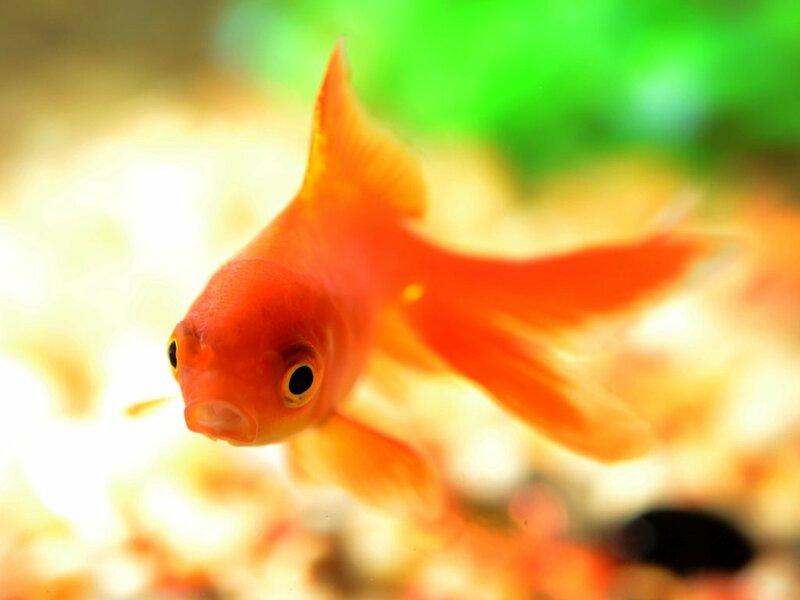 Cigarette smoke, paint fumes, and aerosol sprays can be toxic if they are absorbed into the aquarium water. Place the aquarium in a spot where temperature and light are constant and controllable. Tropical fish supply stores may be able to advise you on the best degree of light for your fish to live in. Remember that direct sunlight and drafts from nearby doors or windows may change the water temperature, and fumes from a nearby kitchen or workshop may injure your fish. Don't overfeed; uneaten food and waste material are broken down into ammonia and nitrites, which are toxic. One expert recommends sprinkling in only as much food as your fish can eat in 30 seconds. If your fish seems sick or lethargic, take him or her to a vet. Fish can be medicated, anesthetized, given shots, and operated on, just like other animals. Bring along a separate sample of the tank water when you go. Most fish enjoy companionship. If you have a single fish, check with friends and neighbors to find another loner whom you may be able to adopt (but don't support the fish trade by going to a dealer).